^ Inc, Merriam-Webster. Merriam-Webster's Geographical Dictionary. Merriam-Webster. 1997: 222. ISBN 9780877795469 （英语）. 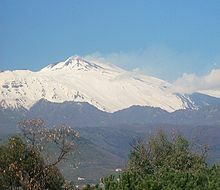 ^ 2.0 2.1 Mount Etna erupts - Mar 08, 1669 - HISTORY.com. HISTORY.com. [2017-09-18]. ^ Falcando, Ugo. The History of the Tyrants of Sicily by "Hugo Falcandus," 1154-69. Manchester University Press. 1998: 216. ISBN 9780719054358 （英语）. ^ Informazioni sul terremoto. storing.ingv.it. [2017-09-18]. ^ Klotz, Stefan. Cross Sectional Dependence in Spatial Econometric Models: With an Application to German Start-up Activity Data. LIT Verlag Münster. 2004: 135. ISBN 9783825879181 （英语）. ^ Diamond, Jon. The Invasion of Sicily 1943. Pen and Sword. 2017: 44. ISBN 9781473896123 （英语）. ^ Domenico, Roy Palmer. The Regions of Italy: A Reference Guide to History and Culture. Greenwood Publishing Group. 2002: 283–284. ISBN 9780313307331 （英语）.